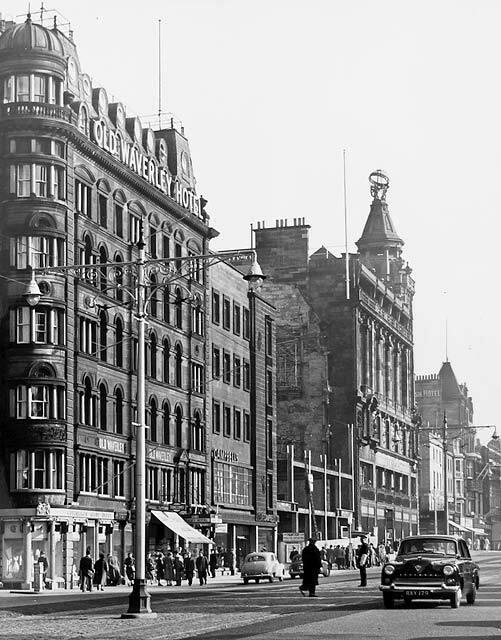 The photo was taken presumably to show the lamp standards in Princes Street, following the removal of the old tram tracks after the trams stopped running in 1956. The vacant plot (where C&A was subsequently built) next to Forsyths may give a clue as to when this photo was taken. The previous building on the vacant plot in this photo was C&A Modes. It was destroyed by fire in November 1955. I remember seeing the smoke and fire engines there from the top deck of a bus on my way to school. Below are a few photos from the same collection as the photo at the top of this page. All photos look to the east along Princes Street. The photos appear below in the order that the views would be seen by somebody walking east from the West End of Princes Street.